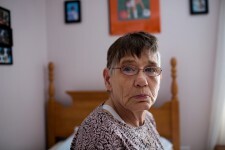 Seen here in her bedroom, Marilyn Davidson, 70, is high functioning and can speak. 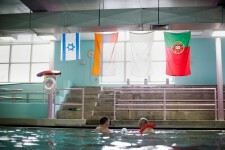 She has lived in the Malone Park residences at the Fernald Center in Waltham, Massachusetts, USA, for 9 years, after living elsewhere on the campus before. She likes to spend time looking and smiling in her mirror. Caregiver Jean Claude Michel (right) walks with resident Michael Martin in the residences in Malone Park at the Fernald Developmental Center in Waltham, Massachusetts, USA. Michael cannot speak. 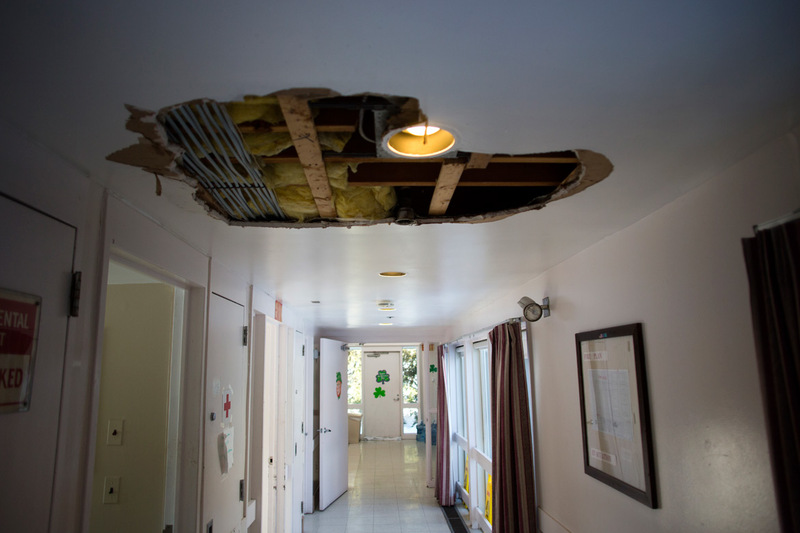 A hole appeared in the ceiling of one of the residences after a recent storm at the Fernald Developmental Center in Waltham, Massachusetts, USA. 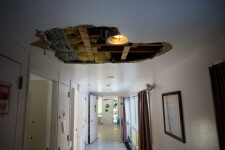 The ceiling is expected to be repaired soon. 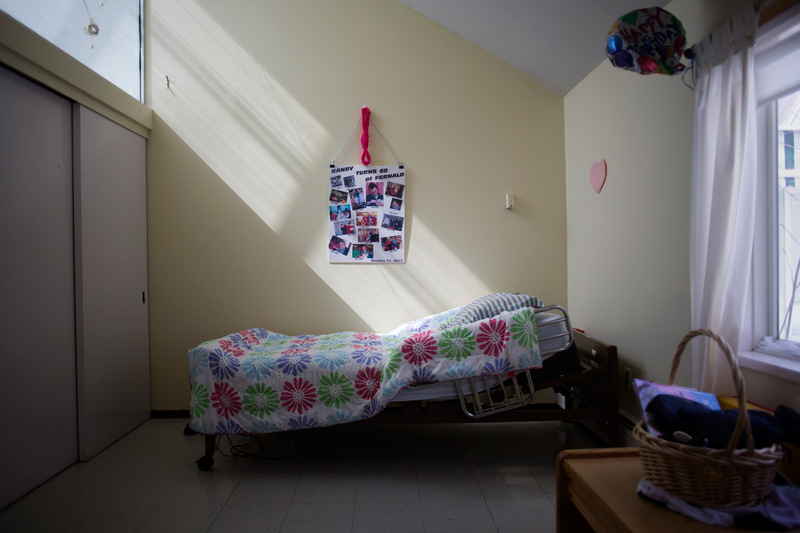 Kelly Kacinski plays with her sister Teresa Kacinski, 46, (right) in Teresa's bedroom in one of the residences in Malone Park at the Fernald Developmental Center in Waltham, Massachusetts, USA. Teresa is confined to a wheelchair, cannot speak, and needs to have her hands restrained when she is awake. Teresa is the youngest resident at the center. 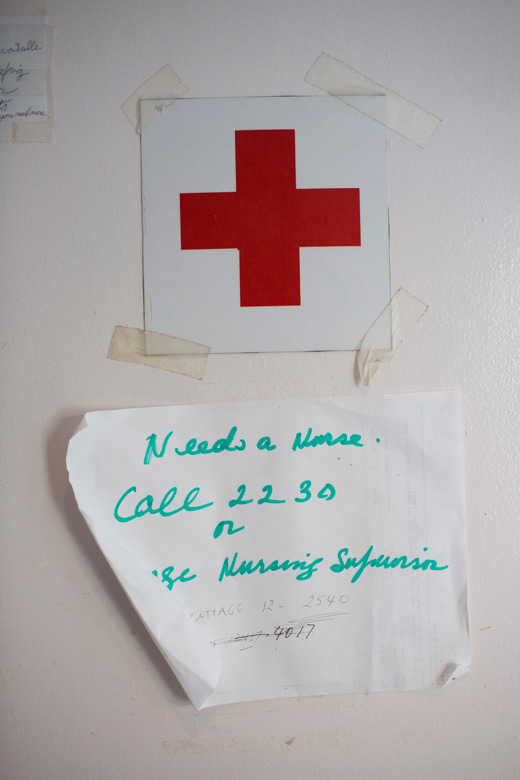 A sign gives contact information for the nurse on duty at the residences in Malone Park at the Fernald Developmental Center in Waltham, Massachusetts, USA. Michael Martin plays with balls after lunch in the residences in Malone Park at the Fernald Developmental Center in Waltham, Massachusetts, USA. 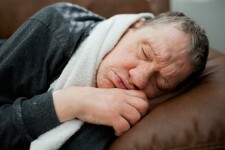 Michael, 52, cannot speak. 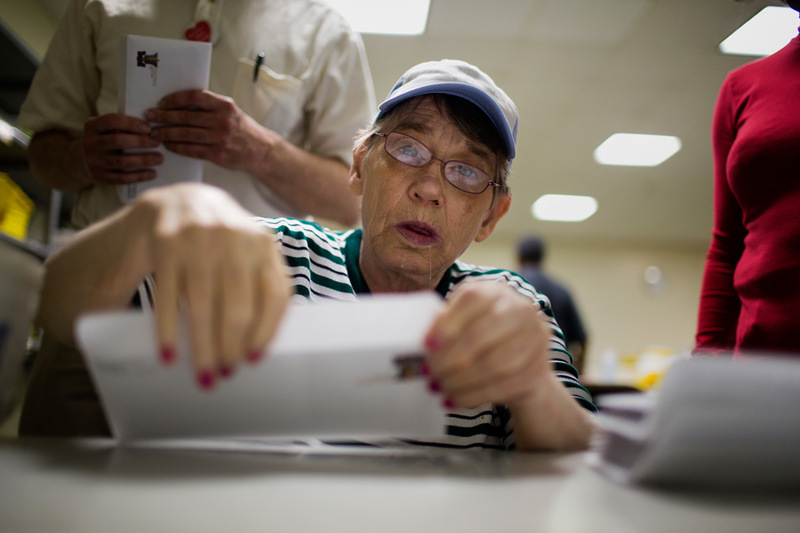 With the assistance of caretaker Georgette Thelismond (in red), Fernald resident Marilyn Davidson folds papers and stuffs envelopes for pay during work time at Site 7 at the Fernald Developmental Center in Waltham, Mass., USA. 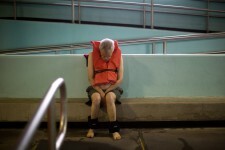 Philip DeRosa, 58, is a resident in Malone Park at the Fernald Developmental Center in Waltham, Massachusetts, USA. 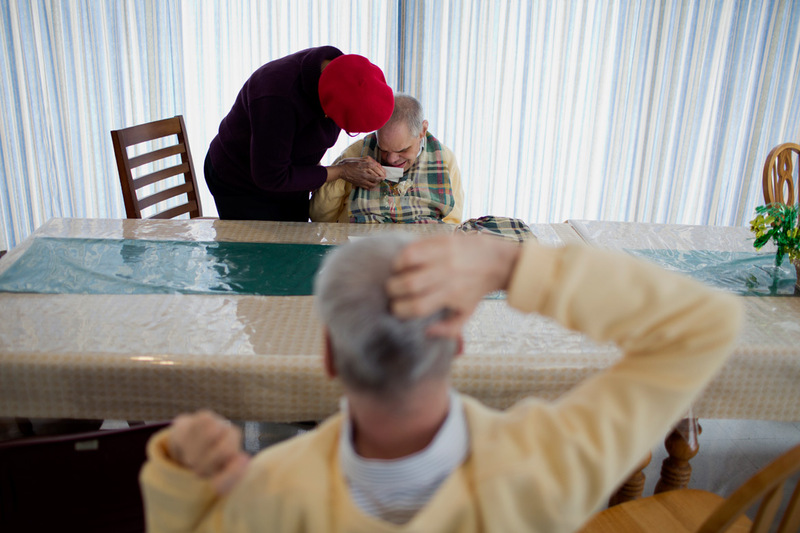 Caregiver Mariam Komate helps Frank Bandolfh, 56, (center) eat at a table for dinner as Kevin Calahane, LPN, feeds resident David Gilmore, 66, (right), at an assisted living home run by Northeast Residential Services in Bedford, Massachusetts, USA. 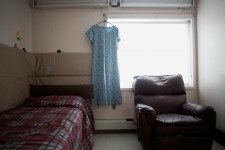 The residents previously lived at the Fernald Developmental Center in Waltham, Massachusetts, USA. 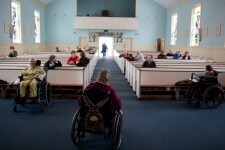 Fernald Developmental Center residents Margaret Rouleau, 84, (from left) Mary Ann Kaufman, 70, and Teresa Kacinski, 46, wait for the service to start in the Chapel of the Holy Innocents in Waltham, Massachusetts, USA. 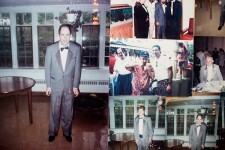 Pictures of Jack Walsh, 62, (left) at the 1993 Spring Ball at the Fernald Developmental Center in Waltham, Massachusetts, USA. 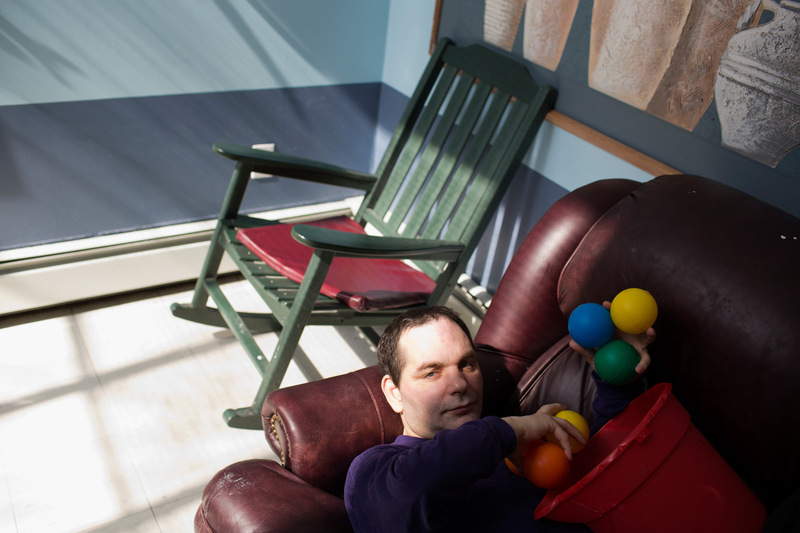 George Eugene Rouse, Jr., 68, naps after lunch in the residences in Malone Park at the Fernald Developmental Center in Waltham, Massachusetts, USA. Rouse was born without problems but contracted spinal meningitis and was institutionalized in 1951. Rouse frequently lays with a towel around his neck surrounded by stuffed animals. A view of the bedroom of Caroline Tucker, 62, at the residences in Malone Park at the Fernald Developmental Center in Waltham, Massachusetts, USA. 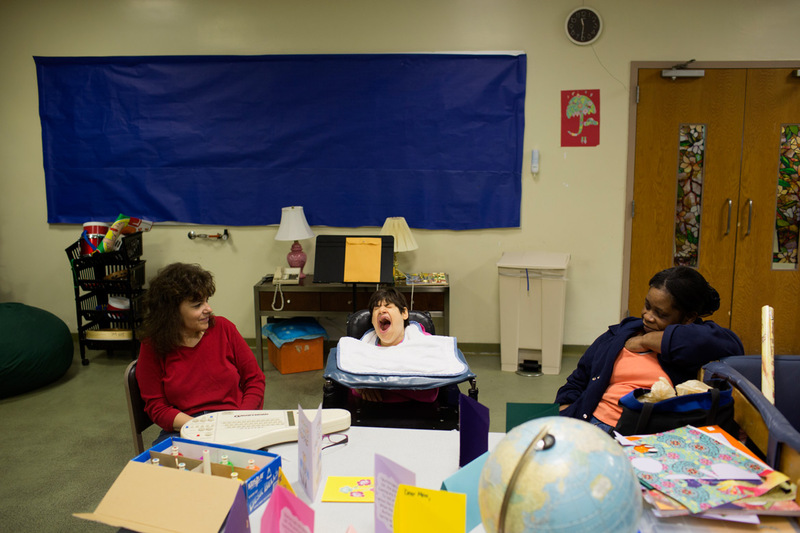 Music therapist Fran Silveira (in red) and caretaker Odette Guillaume-Sine (in blue) work with Fernald resident Teresa Kacinski at Site 7 at the Fernald Developmental Center in Waltham, Mass., USA. Silveira was helping Teresa use an Omnichord electric musical instrument. The Fernald Developmental Center vocational instructor wears a pin that reads "Have a Heart / Save Fernald," in Waltham, Mass., USA. 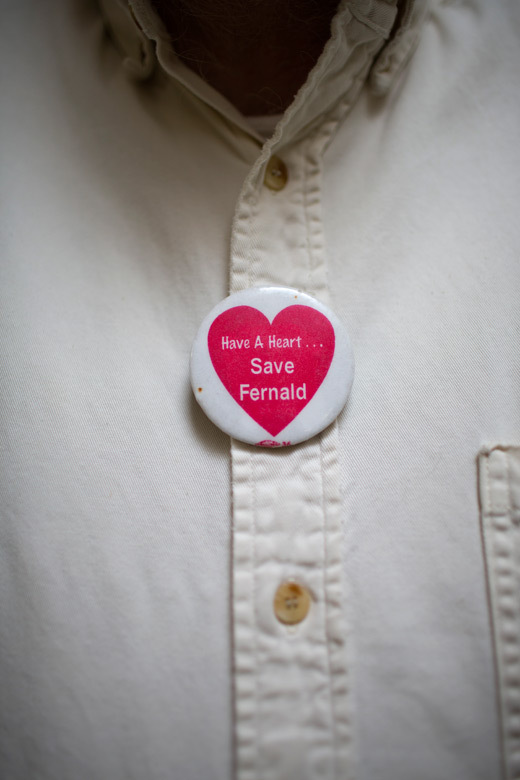 The pins were made by the Fernald League, which started in 2001 as a response to efforts to close Fernald. Caroline Turner, 62, is a resident at the Fernald Developmental Center in Waltham, Massachusetts, USA. Diane Booher (left) walks with her older brother Ronnie Russo, 60, outside the residences in Malone Park at the Fernald Developmental Center in Waltham, Massachusetts, USA. Ronnie and his twin Randy, both blind and unable to speak, have lived at the Fernald Center for 55 years. 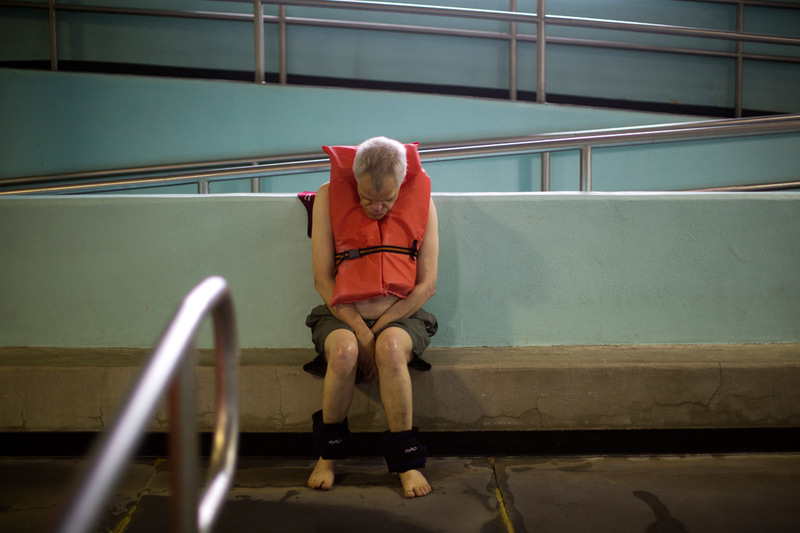 Fernald Developmental Center resident Ronnie Russo waits to get in the pool at the Fernald Center Aquatics pool in the Green Building at Fernald in Waltham, Mass., USA. The twins Ronnie and Randy Russo go to the pool twice a week and, with help from Mike Hebert, walk around the pool with light water weights as a way to get exercise and maintain limb strength. Hebert was an employee at Fernald, but now volunteers as a swim tutor with the twins twice a week. Mike Hebert helps Fernald Developmental Center resident Ronnie Russo (vest) walk in the pool at the Fernald Center Aquatics pool in the Green Building at Fernald in Waltham, Mass., USA. The twins Ronnie and Randy Russo go to the pool twice a week and, with help from Hebert, walk around the pool with light water weights as a way to get exercise and maintain limb strength. Hebert was an employee at Fernald, but now volunteers as a swim tutor with the twins twice a week. 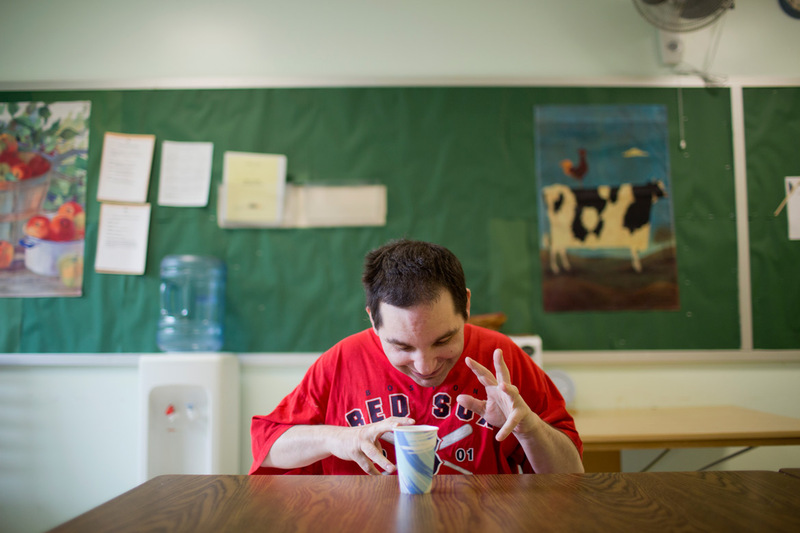 Fernald resident Michael Martin drinks ginger ale during a break from work at Site 7 at the Fernald Developmental Center in Waltham, Massachusetts, USA. 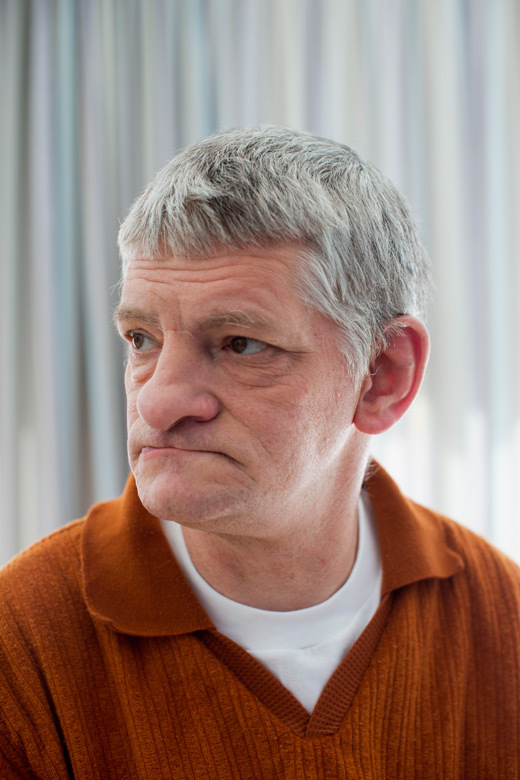 Michael, 52, cannot speak. Some of the residents perform menial tasks for pay. Michael shreds documents. 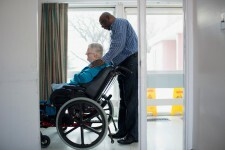 Caregiver Paul Marie Obas (left) helps Randy Russo, 60, eat, while twin brother Ronnie looks on, in the residences in Malone Park at the Fernald Developmental Center in Waltham, Massachusetts, USA. Ronnie and his twin Randy, both blind and unable to speak, have lived at the Fernald Center for 55 years. 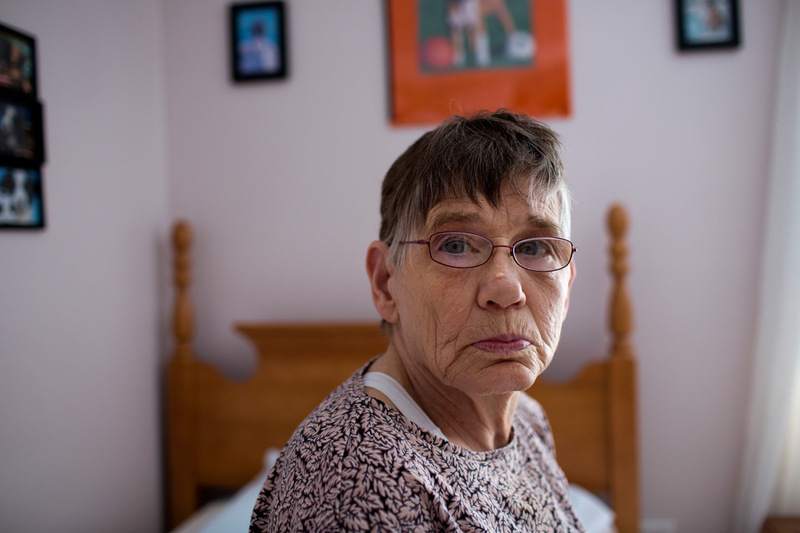 Diane Booher is the younger sister of Randy and Ronnie Russo, 60, seen here in their bedroom at the residences in Malone Park at the Fernald Developmental Center in Waltham, Massachusetts, USA. 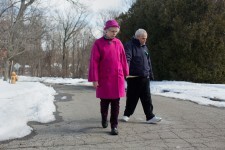 The twins, both blind and unable to speak, have lived at the Fernald Center for 55 years. Decorations commemorate the 60th birthdays of twins Ronnie and Randy Russo in their bedroom at the residences in Malone Park at the Fernald Developmental Center in Waltham, Massachusetts, USA. 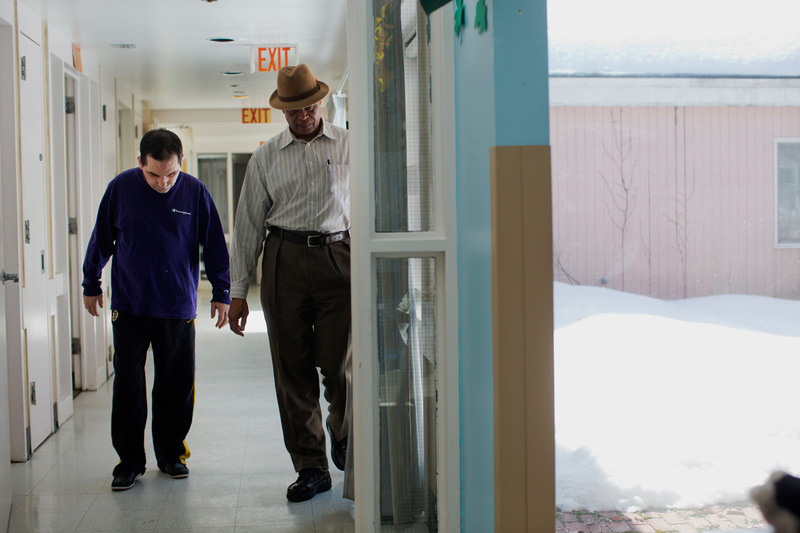 Ronnie and his twin Randy, 60, both blind and unable to speak, have lived at the Fernald Center for 55 years. Potholes mar the road leading to residences at Malone Park at the Fernald Center in Waltham, Massachusetts, USA. 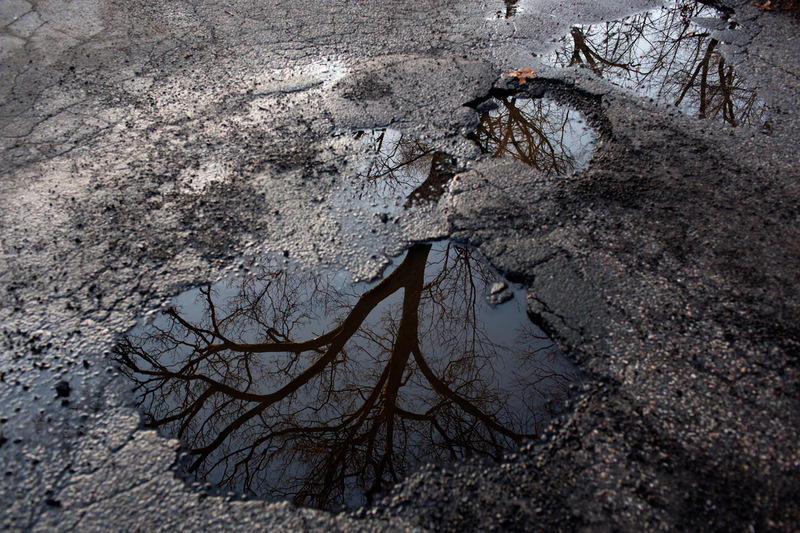 Much of the campus has fallen into disrepair. The Fernald Developmental Center, once home to thousands of mentally disabled men, women, and children, now houses 13 residents. It is the oldest institution for the disabled in the United States and has been under threat of closure since the early 2000s, as politicians have worked to cut costs in state budgets. 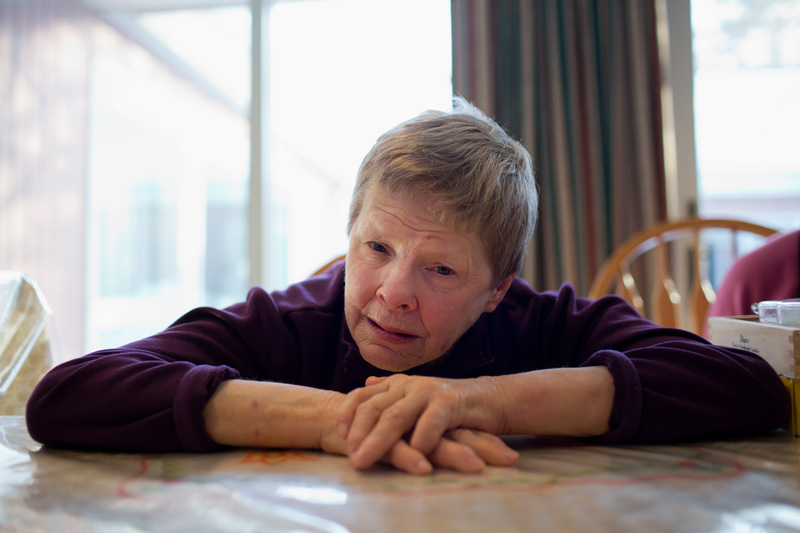 The 186-acre campus of Fernald is largely in disrepair, but the 13 remaining residents have guaranteed level of care rights granted in 1993 as a part of a lawsuit relating to decades of abuse and neglect at the institution. 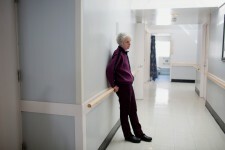 Their guardians don’t want the residents moved to private facilities, especially at this late stage in life. 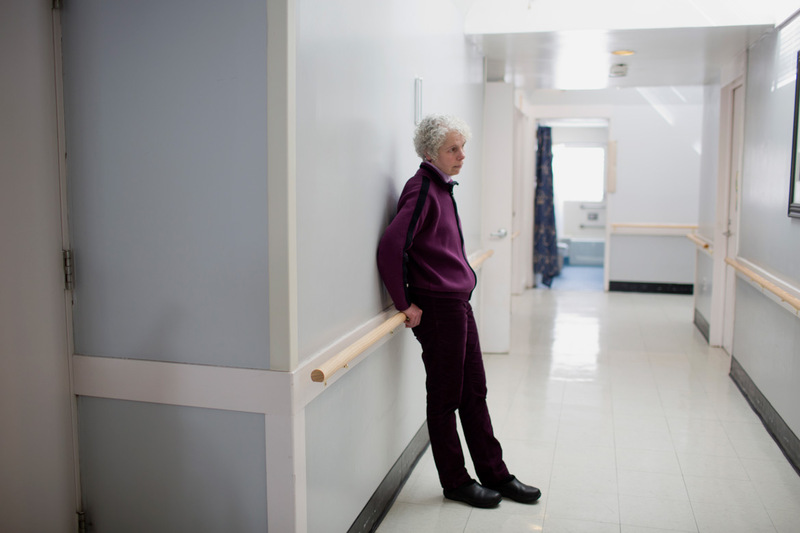 The youngest resident is 46, and the oldest is 84.